Logan Anderson nets the game-winning goal to send the 'Hounds to state for the first time in three years. Logan Anderson didn’t wake up Thursday morning thinking he would become an unlikely hero by day’s end. It just worked out that way. Anderson, a sophomore forward, redirected a shot from behind him 4:50 into overtime to lift Duluth East to a 3-2 victory over Andover in the Class 2A, Section 7 final at Amsoil Arena in Duluth. It capped off a frenzied finish for the No. 3-ranked Greyhounds, who fought back from a two-goal deficit to fend off the upstart Huskies (22-6) and punch its first trip to the state tournament in three years. With the Greyhounds (22-2-3) on the ropes and after a Moorhead loss Wednesday to St. Michael-Albertville, northern Minnesota was in legitimate danger of being shutout of the state tournament. That drama was not lost on Duluth East, as coach Mike Randolph even made it part of his pregame speech. After being outshot 19-3 over the opening 17 minutes, Andover struck first on a Luke Kron goal 1:09 into the second period. A short time later, Charlie Schoen went backhand, top shelf on a breakaway, and the Huskies’ were brewing the upset special. With poor execution in the first period growing worse in the second, the Greyhounds were treading water. 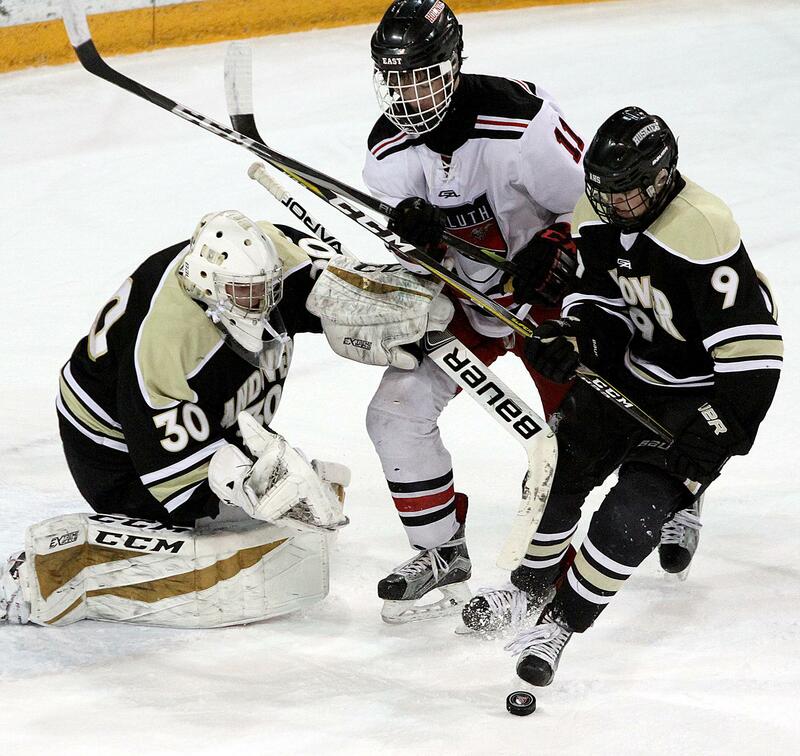 As Duluth East pounded Andover goalie Ben Fitsinger with shots, Fitsinger continued to keep a lid on it, en route to a 50-saves night. Then, a Brendan Baker goal 4:57 into the third swung the momentum into the Greyhounds' hands. Playing from behind is not familiar territory for Duluth East, which averages nearly six goals per game. It was a crisis and an opportunity rolled into one. With an empty net, Duluth East got the equalizer with 1:14 remaining when Ryder Donovan delivered a centering pass from behind the net that bounced around in the crease before crossing the line. Going into the extra session, the Greyhounds knew the game could go either way but felt good about their chances. Now, Duluth East heads south to the state tournament for a 23rd time in school history. But this time, the Greyhounds feel like they will be representing the entire 218 area code. Duluth East sophomore forward Logan Anderson scored the game-winner 4:50 into overtime to help the Hounds complete a comeback and escape with a 3-2 victory in Thursday night’s Class 2A, Section 7 championship at Amsoil Arena in Duluth. The Greyhounds trailed 2-0 heading into the third period before finding their footing down the stretch, and clinched their first trip to the state tournament in three years. Andover (22-6) sophomore Luke Kron opened the scoring 1:09 into the second period when he redirected a shot from the point. A short time later, teammate Charlie Schoen weaved his way through a pair of Duluth East defensemen and shoveled in a backhand shot, top shelf, to push the No. 8-ranked Huskies out front 2-0. The Greyhounds (23-2-3), ranked No. 3 in the latest coaches’ poll, started rolling after Brendan Baker scored the team’s first goal 4:57 into the third period. With an empty net, the Greyhounds earned the equalizer on Ryder Donovan’s goal with 1:14 left, setting up the extra session. Duluth East took the momentum into the overtime period, where Anderson finished things midway through the frame. 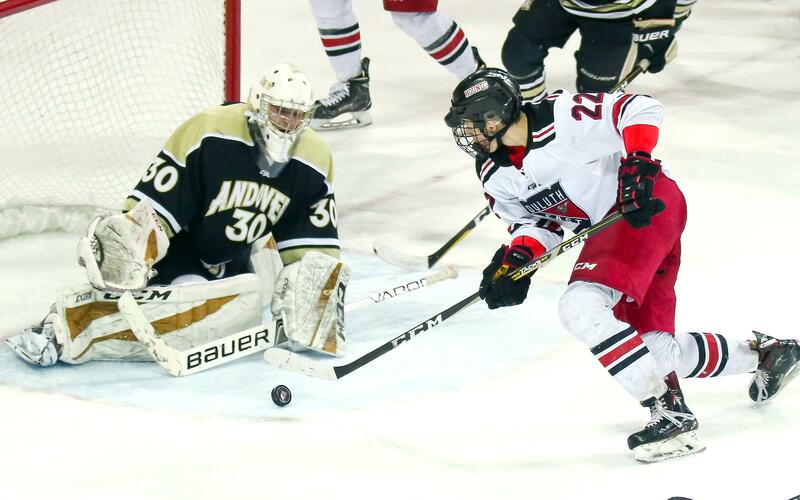 Andover sophomore goaltender Ben Fitsinger finished with 50 saves in the loss, while Duluth East goalie Parker Kleive finished with 18 stops.